I planned this trip a couple of months ago after years of desiring to visit Cinque Terre. I decided to do a whirlwind tour visiting four cities (Venice, Florence, Pisa, and Rome) and an area consisting of five villages (Riomaggiore, Manarola, Corniglia, Vernazza, and Monterosso al Mare) in a seven-day trip. 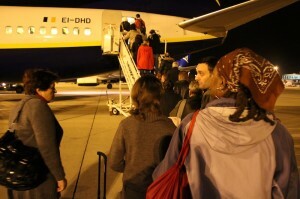 I booked our flights through RyanAir, known for their cheap prices. However, they bypass the typical accoutrements. There are no reserved seats and you don’t walk through a protected tunnel to your plane. You walk outside and board the plane from the front or the rear. Also, they charge you for checked bags and for printing your boarding pass—I’m being charged to use my own ink and paper—don’t even think about not printing or forgetting your pass you’ll pay a lot extra. However, the flight was short and uneventful so I have no complaints. We arrived in Venice and the weather was beautiful. 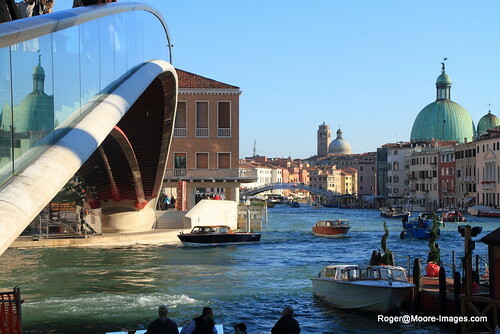 However, RyanAir doesn’t really take you to Venice—even though that’s what they advertise online. You arrive at an airport approximately 60 minutes from the town center. We took a five Euro bus ride near the town center. It’s approximately 11:00 AM and we get onto the vaporetto, the Venice waterbus. Proper planning helps greatly because we knew which line to ride. We traveled the entire length of the Grand Canal getting off and on for one small fee. We reached the Saint Marco Basilica and we began touring the area. As we walked, I noticed a local vendor sponsoring a tour to the nearby islands. 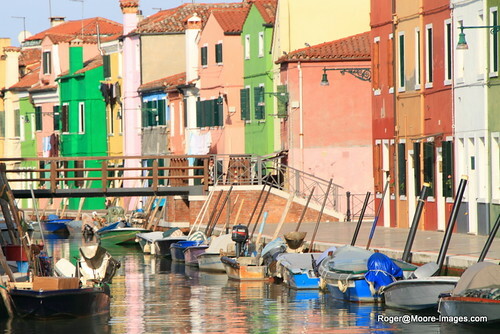 I read a photography article about the Burano Island near Venice and the colorful homes. So, we quickly accepted the opportunity. The tour began with a trip to Murano Island where we watched a local glass-maker make a horse—Wow, not! After we walked through the gift shop, it was on to the next location. We traveled to Burano where the tour guide told us they make a lot of lace on the island. I bypassed that show and began walking around photographing the homes and the people. The colorful homes play a prominent role on the island. In order to maintain the appearance, the residents must get local approval whenever they paint their homes. Originally, the story goes, they painted the homes in a bright color so the inebriated fisherman knew which home to enter when they returned home. The next and final stop was to Torcello Island. I still don’t know why we visited this island. There were a few buildings and a pay-before-you-go bathroom. The entire cruise was 3.5 hours, which seemed too long initially. However, it takes 25 to 35 minutes to get to each island with only a 30 minute stay each time. Therefore, the trip went quickly. 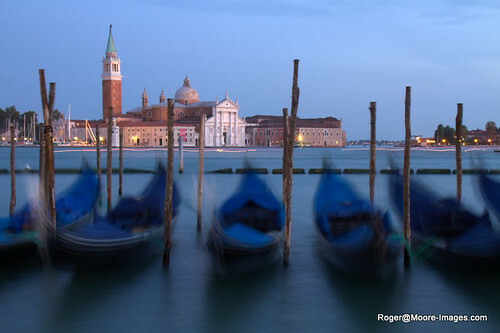 We arrived back at Saint Marco Basilica and I began photographing the gondolas in the water. I saw some beautiful shots of them and I wanted to add my own flare to the image. After doing this, the daylight was fading fast and we were getting hungry and tired. We left our backpacks on the boat whenever we visited the islands. However, lugging them around all day began to take its toll. I pulled out my TomTom to see where the hotel was and it was at the “beginning” of the Grand Canal! After a long ride through the canal we arrived at our hotel, literally a five-minute walk from the beginning of the bus route. If only we’d dropped off our bags prior to touring the city, we could’ve saved ourselves from carrying them all day, so much for proper planning. We checked into the hotel, dropped off the luggage, and found us a place for dinner. Our first day in Italy was productive and we looked forward to a new day at a new location. We got up early, checked out and headed to the train station that was next to the bus stop right near our hotel!!!! The train ride to Florence was two hours. So, it gave us an opportunity to catch some more sleep. 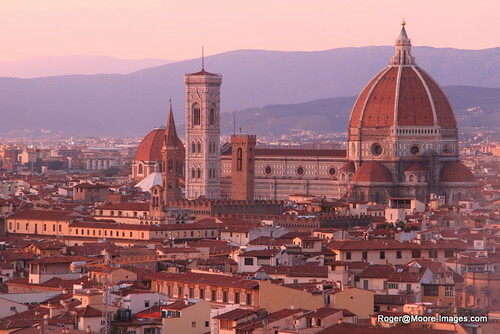 When we arrived in Florence, Rochelle asked if I knew where the hotel is located as we were getting into the taxi. I said, “No” assuming if it were far we’d need the taxi and if it was close the ride would be cheap. However, when I showed the driver the address, he smiled and pointed behind us to our hotel. So, we immediately checked into our hotel and dropped off our luggage! We visited an information desk then began walking around the city. 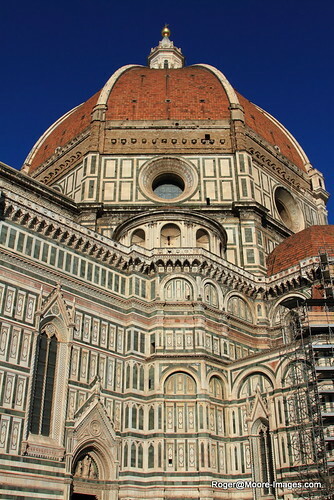 We headed to the Duormo, the Cathedral of Florence. The architecture of the building is amazing. 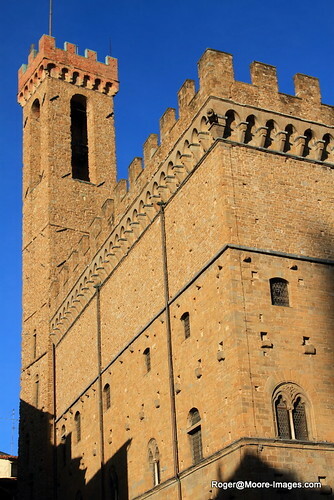 Many cathedrals in Europe allow people to climb to the top. So, we decided to participate and 463 steps later, we arrived amidst a stunning view of the city. However, I’d experience an even better view later that day. Once you’re done and ready to descend, it becomes an exercise of patience as part of the narrow path is used for people ascending and descending. Unfortunately, the stairwell is only wide enough for one direction. We walked to the Accademia. This is where the famous statue of Michelangelo’s David resides. It’s recommended that you make reservations or you’ll have to wait in line. However, we saw two lines, one for people without reservations and one for people “with” reservations. They both were long. I wasn’t pressed with seeing the statue and after my sister’s remarks, which were hilarious, but not suitable for print, I lost all interest. As a photographer, I’m always looking for great views and most of my research centers around that. I read about an area where you can see the city at sunset. So, we began to walk to Pizzale de Michelangelo, an elevated town square. The one fact about any “elevated” place in Europe is it requires strength and stamina. They don’t offer amenities for people with disabilities. You can either hike up the trail or stay where you are. After a mile or so of walking, we arrived at the square and the view was worth it. The colors were brilliant. It never ceases to amaze me how natural colors offer some of the best photographic opportunities. We stayed at the site well past sunset. As we began to leave, we unsuccessfully tried to hale a taxi. However, we walked back to our hotel instead. Once again, we found a place to eat and called it a night after that. The next morning we got up early to take the train to Pisa. It was our first sign of unpleasant weather as it began to rain. I prayed this weather would remain and Pisa would be different. After purchasing our tickets, we boarded the train and headed to our next stop. 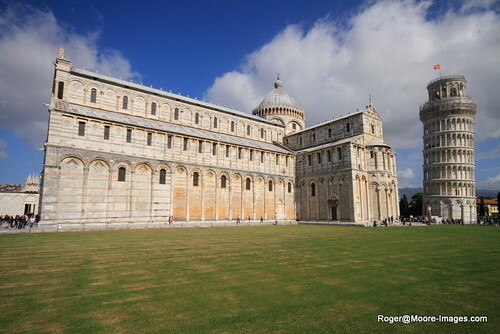 As predicted, the clouds began to break and our arrival at Pisa was greeted with a beautiful blue sky with a few clouds to provide break the color. We discovered a baggage repository so we dropped off our backpacks to lighten the load. We walked around the area and made our way to the famous courtyard. After approximately 25 minutes of walking, we saw this leaning building. We also knew we were getting close because every few feet we saw vendors selling various goods. Rochelle was excited to see the tower because she told me she had this “unique” idea for a photo. She was going to pose in front of the tower and pretend she was holding it! Imagine her disappointment when she saw nearly everyone taking that pose. We walked around the courtyard visiting the many vendors and me taking photos. After a few hours, we returned to the train station because we had to travel to our next stop. We only needed a half-day in Pisa. We obtained our luggage and boarded the train for our next destination. The entire trip was going as planned. However, the highlight for me was now an hour’s train ride to the next stop. Enjoyed the normal high quality of your photos (as usual!). You certainly crammed a lot in those days. Look forward to part 2 of 2. Your pictures are awesome! You should consider doing a coffe table book on your beautiful pictures of Europe.